When in 2014, six stained glass windows were removed from Canterbury cathedral to star in an exhibition at the Getty Museum, California and the Metropolitan Museum of Art, New York, it seemed that the Rubicon had been crossed. As the Met boasted in its exhibition publicity, this was the first time that the windows had left the cathedral precincts in their 850-year history; now, they were not only to be removed, but removed far away and subjected to the extreme risk of air transportation. In the past, various circumstances have led to the temporary removal of stained glass, with routine cleaning and maintenance the most common cause, followed by war and conflict. During the Reformation and the English Civil War and more recently during the Second World War, glass was, on occasion, removed and stored to protect it from danger. This is of course, fundamentally different to removing glass in order to put it on display in museums thousands of miles away and thousands of miles apart. The glass at Canterbury, made by men alive at the time of Thomas Becket’s death in 1170, had seemed as immovable as the cathedral itself, a building old enough to have more in common with the rivers and hills than the relative transience of bricks and mortar. It is fair to say that the very fact of their transatlantic tour has changed the character of these windows irrevocably. Some 20 months ago, as the Canterbury glass touched down in New York from the Getty in California, we asked how in the middle of the one of the worst years in aviation history the Met could be confident of the safety of air transportation [How the Metropolitan Museum of Art gets hold of the world’s most precious and vulnerable treasures]. 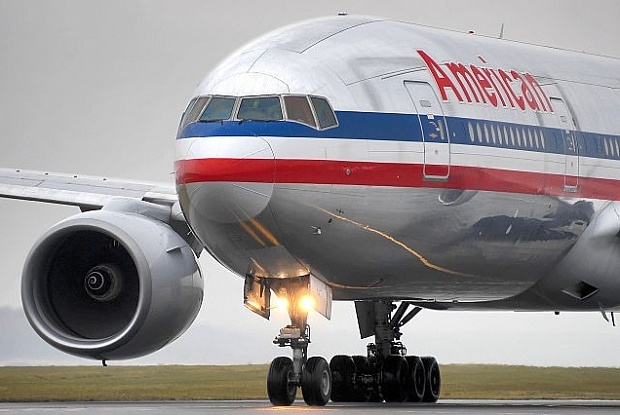 As we begin 2016 fresh with the news of recent air disasters, aeroplanes have not seemed more dangerous in decades – indeed, on February 15th this year, the Art Newspaper reported that American Airlines and seven others are being sued over damage to a Lucio Fontana sculpture when it was flown from Paris to the Armory Show in New York last year. And yet, preparations are underway for another cargo of stained glass to take to the skies, as windows removed as part of the controversial, wholesale restoration of Chartres cathedral form the centrepiece of an exhibition originally scheduled for 2016, but currently postponed, to be hosted by an as yet undisclosed US museum. As at Canterbury, the removal of the Chartres glass for restoration has been taken as a convenient opportunity to send it overseas. Where we speculated as to whether the Church had received any payment for the loan of the Canterbury windows (a question to which we still do not have a definitive answer), in the case of Chartres, just such a transaction is known to have taken place. 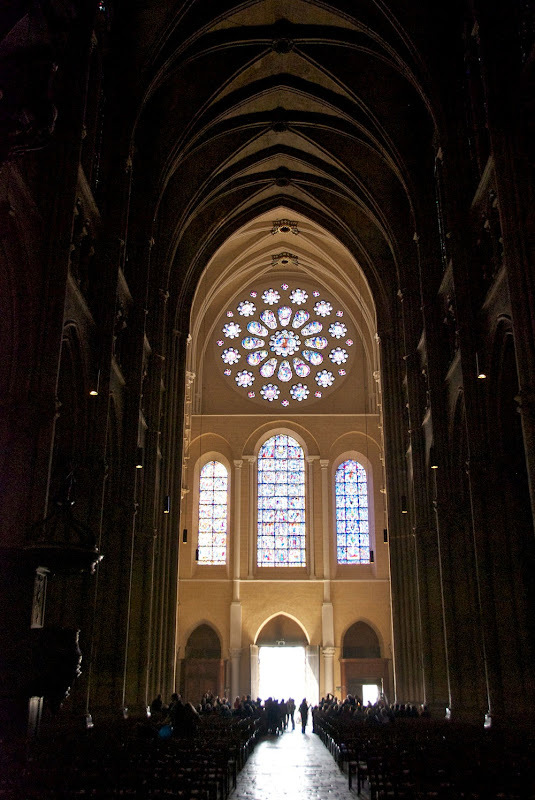 While the cost of the controversial repainting of the cathedral’s interior has been met by the French state and donors including Crédit Agricole, Caisse Val de France et Fondation, and MMA assurances, the restoration of the cathedral’s famous glass has been funded in part by the American Friends of Chartres (AFC), an organisation that works “to raise awareness in the United States of Chartres Cathedral and its unique history, sculpture, stained glass, and architecture and their conservation needs”. In appealing to members of the public to donate to the project, the AFC invokes American efforts to save Chartres from destruction during World War Two, treating the fundraising project as the corollary of the cathedral’s status as “a wonderful testimony to the friendship between the French and American people. The French people honor every year the memory of the Americans who contributed to saving the cathedral from destruction at the end of WWII.” But why, if the AFC is so concerned for the welfare of the cathedral, must the glass be removed from the building, and subjected to a transatlantic tour? 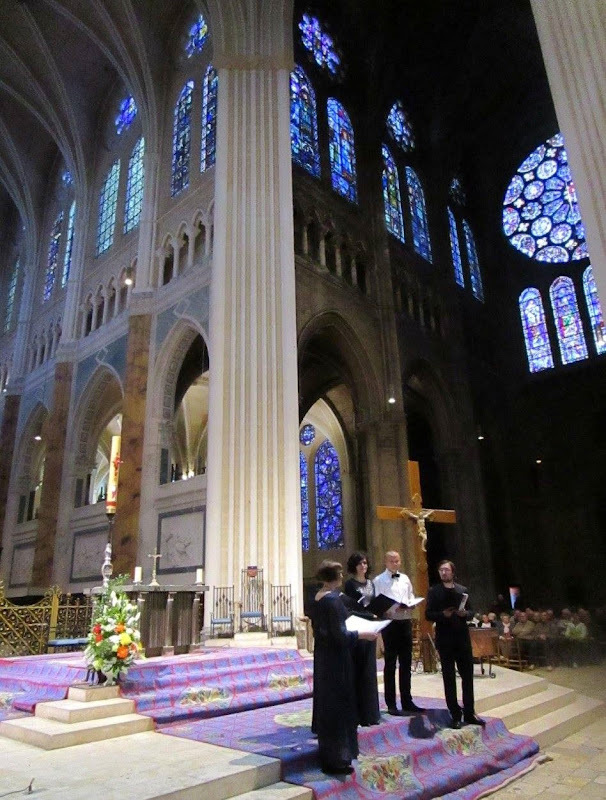 Speaking to French Morning in 2014 about the plans to exhibit the windows in the US, Dominique Lallement, the president of the AFC said: “The lancet windows measure more than 6 meters in height, which means there will have to be a structure built similar to the cathedral to accommodate them.” Given the success of the Canterbury exhibition, which represented a huge coup for the Met, already notorious for its ability to secure rare loans from reluctant lenders, the Chartres exhibition is likely to be equally high-profile, on a scale indicated by the planned construction of a special display area within some as yet un-chosen or unannounced venue. 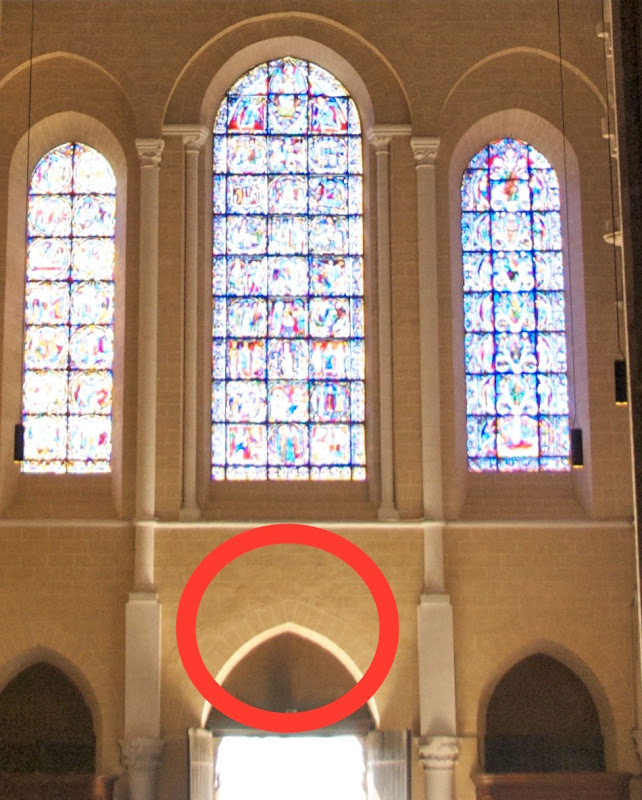 Perhaps the significance and sensitivity of the deal were indicated by the official reaction to architecture critic Martin Filler’s heartfelt but thoughtful attack on the repainting of the cathedral interior. In his blog on the New York Review of Books website, Filler expressed shock at the “scandalous desecration of a cultural holy place”, and accused the French government of breaching the international rules of conservation established in the 1964 Charter of Venice. By highlighting the link between the restoration project as a whole and the loan of the glass to the US, Berthod-Bonnet’s comment cut to the heart of the matter, but without providing any plausible justification for so rash and ill-advised an operation. In fact, the only extended defence of the repainting project has come from Professors Madeline H. Caviness and Jeffrey F. Hamburger, American academics and members of the AFC’s advisory panel, the organisation masterminding the loan of the glass to the US. Responding to Martin Filler via the New York Review of Books website, they adopted a tone of weary condescension, describing Filler as “well-meaning but also misinformed”, conjuring up a picture of a hopelessly deluded aesthete, clinging to a romantic but impossible vision of glorious decay. Professor Hamburger has been a loyal supporter of the Chartres restorers, writing a second defence of the project for Apollo last April, in which he argued that “The restoration of the false masonry proved more of a revelation than a restoration, let alone a recreation”. Either naive or a wilfully blinkered interpretation of the flimsy evidence produced in support of the work, Hamburger’s statement ignores the complexities of the material evidence that exists while also dismissing out of hand the ethical, philosophical and aesthetic problems this project presents. Hamburger and Caviness are keen to put distance between the deal struck in relation to the windows and the restoration project overall, but the relationship between glass and masonry is so thoroughly entwined, on every level, that they are not entirely convincing. Stained glass is such an intrinsic and essential aspect of any Gothic building, as exemplified at Chartres, that common sense dictates that any programme of cleaning and restoration must take into consideration both elements. Accordingly, the rationale put forward by Hamburger and Caviness in support of the restoration hangs on the relationship between glass and masonry, and they insist that: “Combined with the restoration of the windows, the restoration of the original color scheme in fact enhances the perception of color in the windows.” In both intellectual and practical terms, the projects to repaint the masonry and to clean the windows are mutually and irrevocably dependent. Such interdependency seems also to extend to the fundraising projects relating to Chartres. In their response to Martin Filler, Hamburger and Caviness emphasised that the AFC “raises funds only for the restoration of the windows” but fail to explain the function of this arbitrary divide. Dominique Lallement, president of the AFC, told us: “To the best of my knowledge, no donor to American Friends of Chartres is supporting other aspects of the restoration”. But records of donations made to the cathedral’s funding organisations over the past five or six years suggest that there has been overlap between the funding of different aspects of the restoration. In addition, there seems to have been professional overlaps among key players. Both the president of the AFC, and its former vice-president, the late Pierre Louis-Roederer, are listed as donors to Chartres Sanctuaire du Monde (CSM), AFC’s sister organisation. In addition, the president of CSM, Servane de Layre-Mathéus is an honorary member of the Board of Trustees at the AFC, a position which affords no voting rights. Today, CSM raises money for the restoration, principally, of stained-glass windows but has also funded work on the organ, the steps to the high altar and the liturgical furniture in the choir and has a more general role in co-ordinating fundraising efforts made on behalf of the cathedral. Asked to what extent donors to AFC are also involved in funding other areas of the project, Dominique Lallement said: “our fundraising activities are totally separate, as well as the use of our funds. To the best of my knowledge, CSM is also working only on the restoration of the stained-glass windows. CSM finances a percentage of the restoration costs of certain windows, and AFC finances other windows. Thus, for our first project, AFC financed 50% of the restoration costs of the 5 lancets of the South Portal, and the French Government financed the other 50%. For our second project, AFC finances 100% of the restoration costs of Bay 140, the Bakers’ Window.” While both CSM and AFC now confine their activities to the glass, CSM’s funding of a trial that informed the restoration overall, seen in light of the close working relationship between the two organisations, and the crossover of personnel, surely undermines the rather curious attempts to separate the work on the windows from the project as a whole. As advisors to the AFC, Hamburger and Caviness’s defence of the restoration programme clearly cannot be separated from the AFC’s prestigious and lucrative coup to bring the glass to the USA. The anxiety expressed above by chief Chartres fundraiser Catherine Berthod-Bonnet, seems astute in hindsight, having anticipated the wider consequences that such negative publicity could bring to the entire project – a project that, in truth, extended far beyond the cathedral itself and into an intended commercial deal with an American museum. 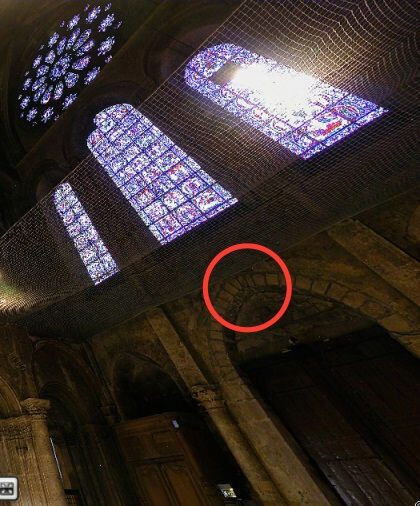 A petition demanding an immediate halt to the restoration work was started in the autumn by American student Stefan Evans and has attracted such high-profile signatories as Professor Sophie Guillouet, an art historian at the University of Rouen. The petition argues that the 1964 Charter of Venice – a document setting out internationally agreed principles for the care and restoration of ancient buildings – has been breached, and makes particular reference to articles 3 and 6. Article 3 stipulates that “The intention of conserving and restoring monuments is to safeguard them no less as works of art than as historical evidence”, a guideline that would seem to have been compromised at Chartres not just because distinctions between building phases have been muddied, but also because evidence of 800 years of aging has been removed. Article 6 states that: “The conservation of a monument implies preserving a setting which is not out of scale. Wherever the traditional setting exists, it must be kept. No new construction, demolition or modification which would alter the relations of mass and colour must be allowed.” Critics argue that current interventions alter the relation of mass and colour fundamentally, and indeed, it could be argued that this is outcome is in fact the primary objective of the project. Given the concerns about the Chartres project raised by experts from around the world, the onus would seem to be on ICOMOS to investigate allegations of such a serious breach or breaches of the very charter that serves as the foundations for the organisation’s existence. But as the charter makes clear that each country is responsible “for applying the plan within the framework of its own culture and traditions” there is little prospect of any meaningful intervention from ICOMOS. 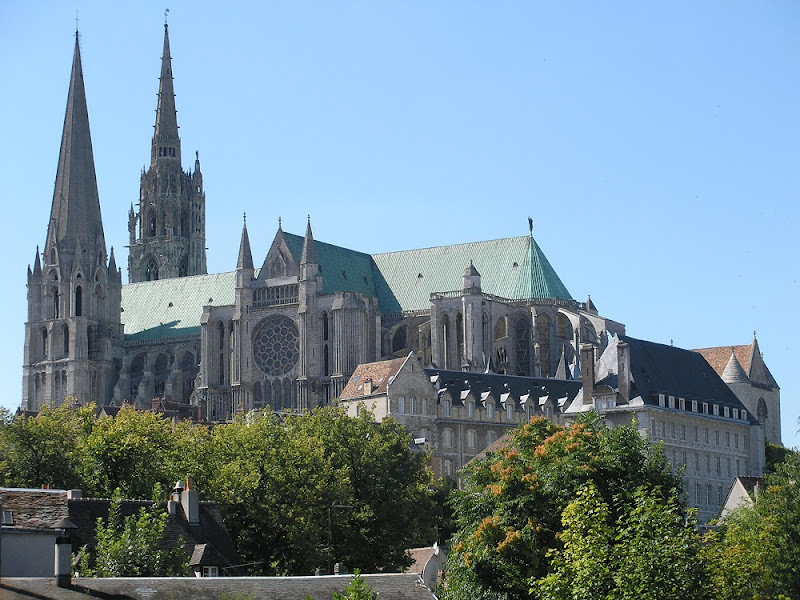 The plight of Chartres is further highlighted by the case of a member of the public who petitioned the European Parliament in 2013, demanding an immediate stop to the restoration at Chartres. 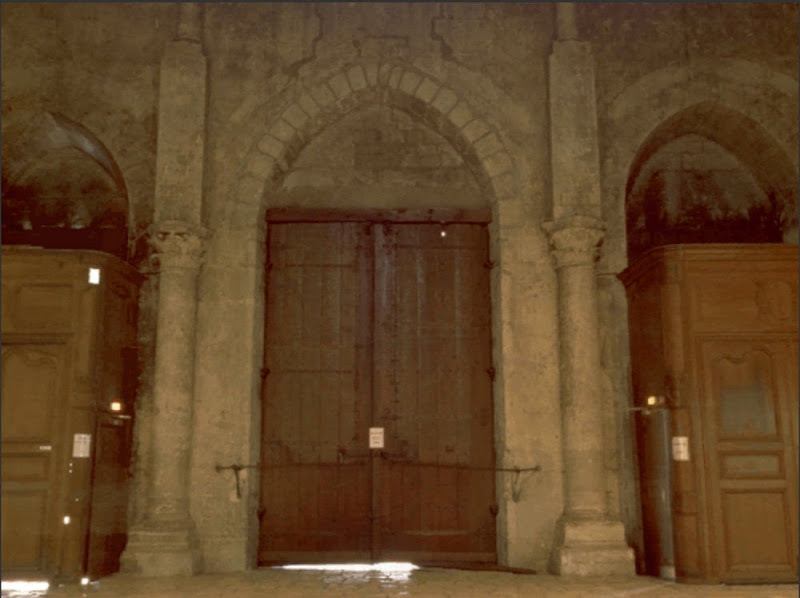 A document issued on 31 January 2014, states “The European Union’s competence in the field of cultural heritage is limited.” Despite co-funding the restoration of Chartres, “the Commission cannot interfere in the way national cultural heritage is protected.” The petitioner, an Italian named Marta Mariani, was told that responsibility for the project lies with the French government and the regional prefecture. As neither international outrage nor a petition have so far elicited anything more than disdain from the French authorities, it is clear that no institution has either the teeth or the will to act. Above, Fig. 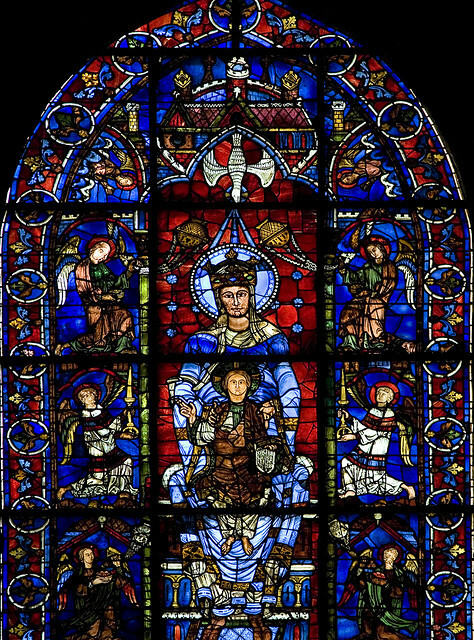 1: Top, part of the Belle Verrière window at Chartres Cathedral. Above, Fig. 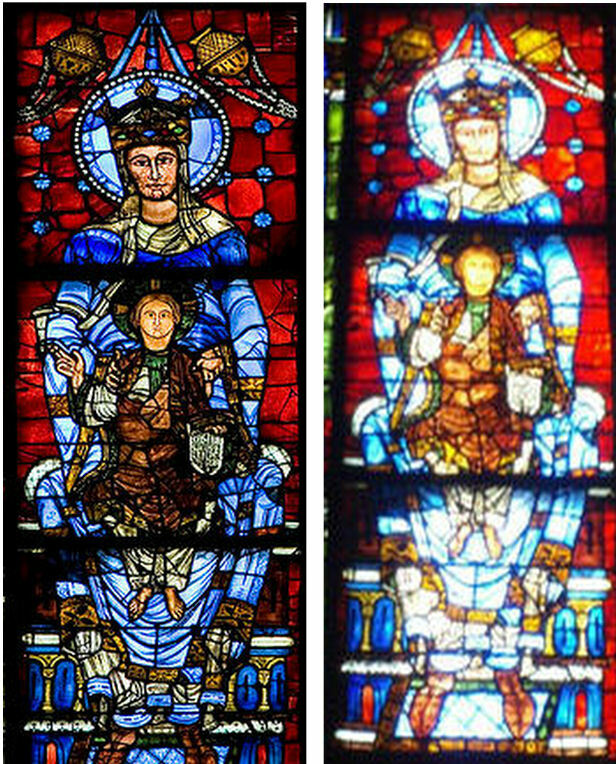 2a and 2b: Part of Belle Verrière window, as seen before cleaning (left) and after cleaning (right). CAN YOU SPOT THE DIFFERENCE ABOVE? 19 February: Although this ‘after-restoration’ image is of low resolution the comparison of pre- and post-restoration states is highly disturbing and we accordingly requested a high quality photograph of the Bakers’ window which, on restoration, was to be dispatched to an American museum. The American Friends of Chartres have declined to send one. Instead, they have in effect erected a Catch 22 obstacle, saying: “Show us what you’ll be saying in your article and photo-captions and we will then decide whether or not to supply them”. As Mr Kuehl presumably appreciated, we cannot possibly comply with such an irrational and perverse requirement – we can only comment on that which we can see. We therefore draw attention to the cautionary disparity between the Belle Verrière window before its treatment and afterwards on the available, already published photographs. 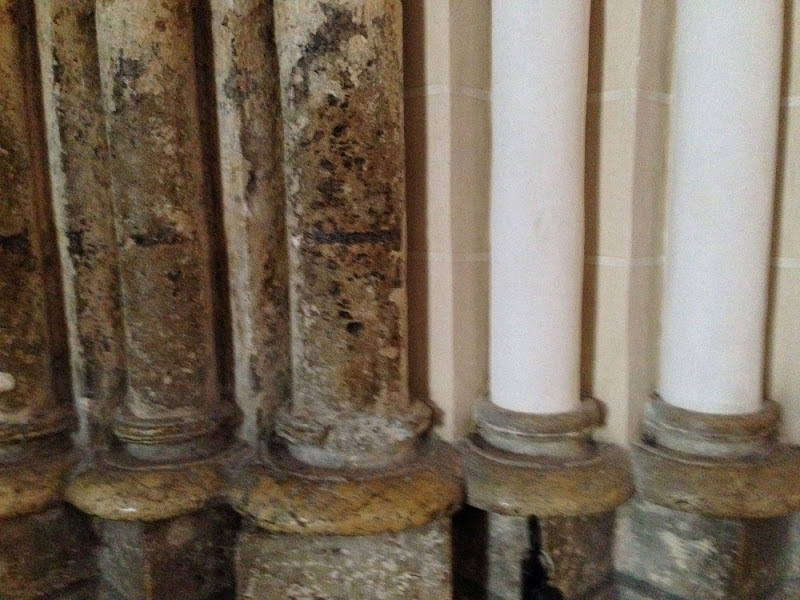 In our organisational experience, reluctance on the part of restorers to supply high quality directly comparable before- and after-treatment photographs is almost invariably an indication that damage has occurred during treatment. There is much talk of ethics in conservation practice. If such is to have substance it is imperative that records of all of the various states of works be freely available to interested parties – how else might errors be detected and injurious procedures halted? Certainly, on the evidence of the comparative photographs shown at Figs. 2a and 2b, there would appear to have been substantial losses of colour on the Belle Verrière window during its “restoration”. The claims on the American Friends of Chartres website that the colours are startlingly bright and that the colours now pop out are both vulgar and imprecise. Why should the colours of the glass at Chartres startle anyone? Why should colours that previously were both individually strong and collectively harmonious (as seen at Figs. 1 and 2a) have ceased to be so as a result of a restoration? With regard to the reliability of photographic evidence in these matters, we refer the reader/viewer to an earlier, and grotesquely bungled restoration, that of Michelangelo’s frescoes in the Sistine Chapel. Above, Fig. 3: Top, a section of Michelangelo’s Sistine Chapel ceiling frescoes, as seen before restoration (left) and after restoration (right). 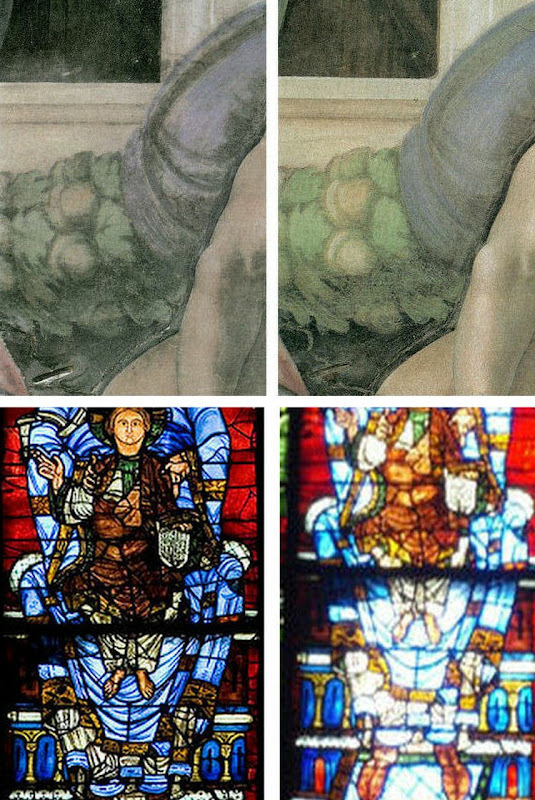 Above, a section of the Belle Verrière windows at Chartres Cathedral, as seen before restoration (left) and after restoration (right). Above, Fig. 4: An American Airlines plane. See left for an account of damage to a Lucio Fontana sculpture when it was flown from Paris to the Armory Show in New York last year. Above, Fig. 6: View looking west showing the painted masonry against the uncleaned masonry. Above, Fig. 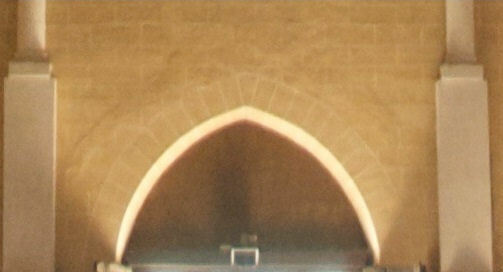 7: Detail showing the repainted masonry. Above, Fig. 8: View looking SE showing painted and unpainted areas adjacent to each other. Above, Figs. 9 and 10: Views of west end before restoration and painting. Above, Fig. 11: View of west end after restoration and the painting of fictive masonry. Above, Fig. 12: The west door before treatment. Above, Figs. 13 and 14: A detail of the west door before (top) and after (above) treatment. This entry was posted on February 16, 2016. It was filed under blog and was tagged with 1964 Charter of Venice, Canterbury Cathedral Glass, Chartes cathedral petition, Chartres Cathedral, Dominique Lallement, Florence Hallett, Flying Cathedral windows to America, Martin Filler, Michael Daley, The American Friends of Chartres, The Metropolitan Museum.